An album ahead of its time? After listening to the thing several times, I have got to say that OMD probably were preceding the likes of Boards of Canada, amongst others, by at least 15 years. While some of the tracks are not songs, but random snatches of radio broadcasts (like the eerie opener, Radio Prague, which, though melodic, still feels like it is being dredged from the depths of a bad dream), others are sugarsweet pop melodies with bouncy electro. Sugarsweet melodies, bouncy electro – and lyrical themes that tackle subjects such as Genetic Engineering (on ‘Genetic Engineering’, obviously). The lyrics, in typical OMD style, do not deal with the usual themes like boy-mmets-girl. In previous years, for example, they had sung about the US Air Force B-29 bomber that dropped the first nuclear bomb during wartime (‘Enola Gay’). The lead single of this album, ‘Telegraph’, is a blissful hymn to maybe not understanding, but embracing new ideas anyway (in this case, mass communication). The confusion in the lyrics seems to encapsulate the initial reaction to the album, which was not favourably reviewed on its initial release, and not met with mass approval by listeners. 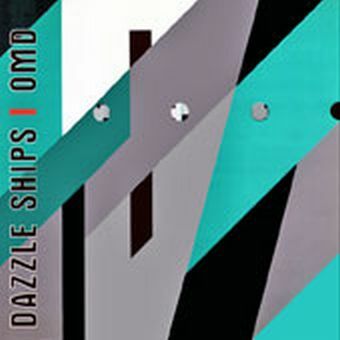 ‘Dazzle Ships’ was borne out of the frustration of writers block that affected Andy McCluskey, and there are signs of this, such as the inclusion of reworked B-Sides (like ‘Romance of the Telescope’), but the overall composition of the album, with its snatches of Eastern Bloc radio broadcasts, robotic voices, upbeat melodies and musique concrete making sense in todays musical framework, where the likes of Kraftwerk (an obvious influence here) have long been feted. Orchestral Manoeuvres in the Dark (to use their full name) produced some fantastic electro/futurist pop in the eighties, with gems such as ‘Electricity’ and ‘Enola Gay’ still sounding great today. ‘Dazzle Ships’ can be viewed as their great leap forward, and their creative highpoint. Brave to the point of risking their fanbase, this album is a fitting tribute to those artists willing to challenge the expectations of the listener without being wilfully obtuse. They were never this challenging again – in 1984 they released the album ‘Junk Culture’, a more upbeat collection including top 5 UK hit ‘Locomotion’.